The findings of the autopsy on Senna's death were read out in court. The report confirmed Senna's injuries were compatible with a massive blow above the right eyebrow. 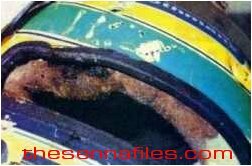 Pathologist Carrado Cipolla, said that Senna died not from the impact itself, but from a "blow to the head from a blunt object," indicating a photograph apparently showing a section of the front suspension. 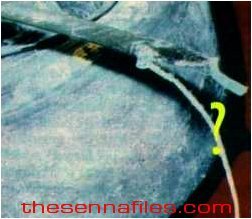 The following picture shows Ayrton Senna's visor was pierced by something, certain experts believing he was killed almost immediately. 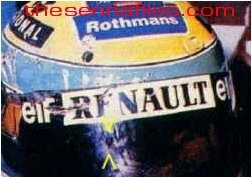 The round aperture shown in the top of Senna's helmet is a vent hole, the plug assumedly knocked out during the crash. The blow was said to have crushed the front part of Senna's brain killing him instantly, although his heart and lungs continued to work assisted by a life-support machine, which was eventually turned off. The official time of Senna's death was therefore given as 14.17, although 'cardiac death' came at 18.40. It was reported that most likely part of the suspension, with the wheel still attached, speared through Senna's visor entering his skull. The picture below shows the helmet was certainly subject to forcible impact, but did this occur at the same time as the damage to the visor? Did this really cause Ayrton Senna's fatal injury, and if so why couldn't forensic testing have proved the theory?